The story of, “The Luci,” as fans call it starts many years ago. Donna Conners and Luci Bonneau met through bowling and became travel partners on the LPBT. In 1999, Bonneau was battling breast cancer and Conners never left her side. They dreamed of creating a bowling tournament to raise funds for breast cancer research when her treatment was complete. When Bonneau passed away, Conners knew she had to build the event they dreamed about. Storm Bowling Products have been proud sponsors of the event since 2002 and supports the event in every way possible. It’s an event that our team looks forward to each year. In January, Donna Conners joined Bill and Barbara Chrisman to make a donation to the Huntsman Cancer Institute. 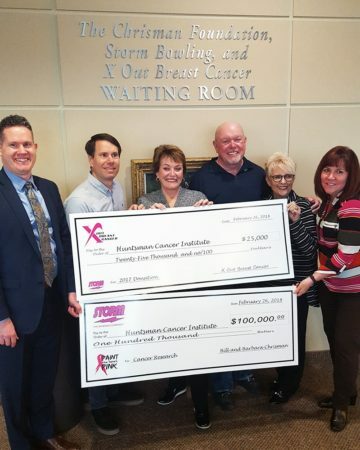 This contribution of $125,000 was a combination of the funds raised during our annual Paint The Lanes Pink campaign, a portion raised at the Luci, and a donation from The Chrisman Foundation. The tournament fills up quickly. Entry blanks are posted live on the website on January 1 and she starts receiving entries that same day. Although the players are competing for a title and a $16,000 top prize they all know that this event means more than just that. In 2017, the event raised $87,000 to help fund breast cancer research and Conners is excited to expand the field and continue growing the event this year. All of the funds raised are donated to The Rose, a Houston-based organization that helps women who can’t afford breast care treatment or mammograms, and the Huntsman Group, a cancer research based in Utah. Conners and all of her volunteers try to make sure that the players who participate in the event know how grateful she is for their presence and support. They have stayed with her and helped the event grow year after year. “I want every person to come and have a fun weekend at the event,” Conners said. A new addition to the event this year is the special “Beauties vs. Beasts” match. The top bowlers from last year’s qualifying will bowl in a five-game baker match to kick off the weekend. The event will be aired on PBA Xtra Frame on FloBowling on Thursday at 4 pm Central. Conners usually starts preparing for the next event the day after the current year wraps up. We know she’ll have some surprises up her sleeve for the 20thAnniversary Event in 2019! We’ll have some special announcements all weekend long. If you’re interested in making a donation, check out the “Pennies for Pins “ page here to pick your favorite player! Click here for more info.